Your dog’s hygiene is very important, and this includes keeping their coat well-groomed and teeth cleaned. Just like humans, dogs need their teeth regularly cleaned in order to prevent plaque build-up and gum disease. Of course, dogs can’t use the same toothpaste as humans and require a different formulation that is specific to canines. It can be difficult to figure out which dog toothpaste are worth it and which aren’t. We all want what is best for our pets. We reviewed dozens of dog toothpaste to identify the best of the best. We considered formulation, bad breath fighting power, ease of use, flavor, and safety when reviewing each product. For fresh breath and shining teeth, this toothpaste is the best option. We quickly discovered that Petrodex Enzymatic Toothpaste for Dogs is the best toothpaste available for dogs. It is formulated to control plaque and prevent tartar formation. Plus, it can freshen breath and polish teeth. It even comes in a tasty peanut flavor your dog is sure to love. When it comes to keeping a dog’s mouth clean, Petrodex Enzymatic Toothpaste for Dogs checks all the boxes. It is formulated with patented enzymes that fight plaque and prevent tartar buildup. It is non-foaming and completely edible, so you don’t have to worry about rinsing your dog’s mouth afterward. When used regularly, it kills bad breath causing bacteria and prevents foul-smelling doggy breath from forming. It is recommended that you brush your dog’s teeth with this toothpaste at least 2-3 times a week. However, brushing them more will not harm your pet and will keep their teeth cleaner. If you do have particularly bad breath and infection has been ruled out, you might want to consider using this toothpaste more than the bare minimum. Of course, any brushing is better than no brushing. If you can only manage to brush your dog’s teeth once a week, at least you’re brushing them at all. This toothpaste is peanut flavor, and many dogs love the flavor. You will need to soft-bristled dog toothbrush to use it, of course. The same company that makes the toothpaste also makes dog toothbrushes, so that might be something you want to consider. Customers loved how well this toothpaste worked. Even with only very gentle brushing, this toothpaste successfully prevents tartar from forming, improving your dog’s dental health for years to come. Some customers even reported that this toothpaste got rid of existing tartar. It is never too late to start caring for your dog’s teeth. This enzymatic toothpaste is a great option for gum health. If your main concern is keeping your dog’s oral health, you can’t go wrong with Arm & Hammer Enzymatic Toothpaste for Dogs. This toothpaste also contains enzymes, so you won’t have to spend as much time brushing your dog’s teeth. Unlike brushing your own teeth, this toothpaste does most of the work for you, which is particularly helpful if your canine doesn’t like having their teeth brushed. However, this toothpaste was reported not to taste as good as some of the other options. If your dog is a picky eater, that might turn them off from having their teeth brushed. There are a few different flavors available though, so it might be worth trying a few different ones if your pooch isn’t a huge fan. This toothpaste is also said not to smell as good as some other options. If you’re getting a toothpaste mostly to help with your dog’s bad breath, get our top pick instead. This toothpaste is made using only natural ingredients. It is infused with baking soda and is suitable for all dogs of any age, including puppies. This toothpaste is so gentle that it can even sooth sensitive and inflamed gums, making it a great option for those with delicate gums. For the budget conscious pet owner. Even those on a budget need to keep their dog’s dental health in check. 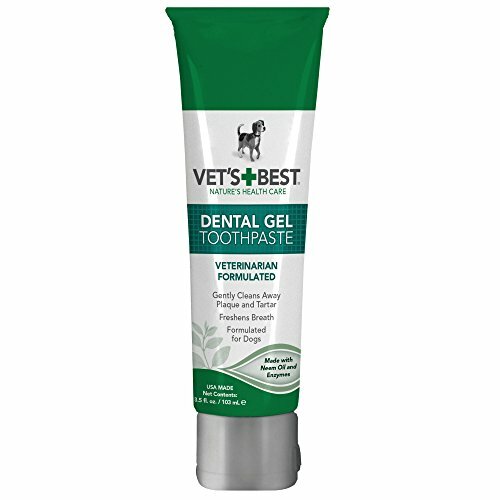 Vet’s Best Enzymatic Dog Toothpaste is an inexpensive yet suitable option for dog owners on a budget. This toothpaste for dogs is designed to clean your dog’s teeth while also freshening their breath. It gently cleans away plaque and prevents tartar from forming. Formulated to be soothing, this toothpaste includes ingredients such as aloe, baking soda, neem oil, and enzymes. It is tough on plague and bacteria but gentle on your pet’s teeth. There are multiple ways to apply this toothpaste depending on your needs. A dab of toothpaste on your pet’s tongue instantly freshens their breath. You can also apply it using your finger or a toothbrush, depending on your preference. This toothpaste is available in a set that includes a toothbrush if you want to go that route. However, many customers who purchased the toothbrush set option were very disappointed in the toothbrush design. Because this toothpaste is slightly lower quality than the others, it does not work as well as some of our picks. It does not freshen a dog’s breath as well as some other products might and is only appropriate for supporting your dog’s dental hygiene in between annual cleanings at the vet office. If your dog just really doesn’t like getting their teeth brushed, you might want to try this. Sometimes no matter how hard we try, our dogs just don’t like getting their teeth brushed. However, as pet parents, it is our job to keep our dogs healthy, including those that just hate having their teeth cleaned. Luckily, Ark Naturals Brushless Toothpaste can take the stress out of your dog’s oral care routine. These award-winning, chewable toothpaste treats are designed to clean your dog’s teeth and kill bad breath causing bacteria with no brushing needed. These treats feature a gentle yet abrasive surface on the outside with a patented toothpaste filling on the inside. Now, your pet can practically brush their own teeth. These toothpaste treats are made with only natural ingredients such as alfalfa, cinnamon, vanilla, and clove. They are free of corn, soy, and wheat, as well as artificial colors and preservatives. There are quite a few different sizes available, so they are suitable no matter your dog’s size. There also have senior treat options for older canines. It is recommended that you give your dog one of these toothpaste chews twice a day. This regime makes it a more expensive option than just plain toothpaste, but the extra money can be worth it if your dog really hates getting their teeth brushed. This set includes everything you need to take care of your dog’s oral health. Need a toothbrush for your dog as well? If you’ve adopted a new dog or are just beginning to brush your dog’s teeth, you’re likely in need of a toothbrush for your dog. In these cases, purchasing a set that includes both a toothbrush and toothpaste is likely to save you a little bit of money and time. The Arm & Hammer Dental Kit for Dogs is a great option in these circumstances. It includes the same toothpaste as our runner up pick, but includes a toothbrush as well. The toothpaste is formulated to fight bad breath-causing bacteria, prevent the formation of tartar, and control plaque. 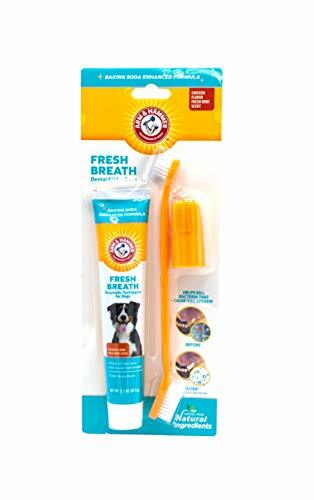 It is easy to use and even comes with instructions on introducing your canine to getting their teeth brushed. For best results, it is recommended that you brush with this toothpaste at least twice a week. More is always better, but not completely necessary, especially if your dog’s teeth are already in decent health. This dental kit is suitable for dogs of all ages and is completely safe. There is multiple flavors available, so feel free to try a couple out to see which your dog prefers. If you’re purchasing a toothpaste for bad breath fighting purposes, other customers recommended the vanilla ginger flavor specifically. Dogs need their teeth regularly cleaned in order to stay healthy, just like people. If a dog’s teeth are not cared for, there is a high chance of gum disease, tooth loss, and chronic pain, especially later in life. Regularly brushing your dog’s teeth with toothpaste can prevent many of these diseases from happening. If you have a dog, it is paramount that you invest in a good toothpaste that will keep their teeth clean and healthy for years to come. While all dogs need their teeth cleaned, some benefit from regular cleaning more than others. Dogs with “squished” muzzles often have teeth that are closer together than normal, leading to an increased chance for gum disease and tartar build-up. Dogs like this will benefit particularly from having their teeth brushed with a high-quality toothpaste regularly. Of course, just because you’re brushing your dog’s teeth at home does not mean that you can skip the cleanings at your vet’s office. If you’re looking for more essentials to keep your pup well-groomed, you should also check out our review of the best dog grooming clippers. Formulation. If toothpaste isn’t properly formulated, it isn’t going to work well. It is paramount that whatever toothpaste you choose actually works well and contains high-quality ingredients. A toothpaste with enzymes in it is often best, as this will reduce the amount of actual brushing you need to do. However, this is not absolutely necessary for every dog. When in doubt, take a look at the customer reviews or pick one of our top five products. Safety. Because the toothpaste is going to go directly in our dog’s mouth, it is essential that it is safe for them to ingest. This is one of the major reasons why dogs need their own, particularly formulated toothpaste; many toothpaste humans use are toxic to dogs in large doses. Your dog’s toothpaste should contain only safe ingredients and be safe for your dog to ingest. Breath freshening ability. While the major point of dog toothpaste is to clean our pet’s teeth, our dog’s minty fresh breath is a good side effect. If your dog has particularly bad breath, you should ensure that whatever toothpaste you choose is designed to fight bad breath. Bad breath can also be caused by health issues, however, so be sure to contact your vet if your dog suddenly develops foul breath, especially if you’re brushing their teeth. Ease of use. Let’s face it: most dogs hate brushing their teeth. Luckily, most toothpaste are designed with this in mind and need minimal brushing or none at all. Toothpaste with enzymes in them require very little brushing on your part. There are even toothpaste treats that require no brushing at all. If your dog particularly puts up a fight to have their teeth brushed, consider getting toothpaste that is extremely easy to use. Flavor. Toothpaste that is flavored is often more inviting for dogs. Of course, not just any flavor will do. Meat-based flavors such as chicken and beef are usually the most popular, though some dogs with a sweet tooth might be more interested in flavors like vanilla. Luckily, many toothpaste brands offer multiple flavors, so you can try a few out to see which one your dog prefers. Getting a flavor they like will encourage them to put up with the toothbrushing routine. What is enzymatic toothpaste and how does it work? Enzymatic toothpaste for dogs contains enzymes that help keep your pet’s mouth clean. The enzymes convert to antimicrobial compounds, which reduce and kill bacteria in the mouth and prevent tartar buildup. Most enzymatic toothpaste include lucose oxidase (GOx) or a combination of GOx and lactoperoxidase (LPO). Glucose oxidase converts to hydrogen peroxide in the mouth, which kills bacteria, while lucose oxidase is an enzyme that helps reduce microorganisms in the mouth when paired with GOx. Why you might gawk at the idea of brushing your dog’s teeth or think it is too difficult, dogs really do need their teeth regularly cleaned in order to be happy and healthy. Otherwise, tartar and plaque will build up in their mouth, causing cavities, gum disease, and other painful conditions. Dogs might even need their teeth pulled and can develop eating difficulties if their teeth are no cared for. Though it is rare, some dogs have even died due to disease caused by poor oral hygiene. Your dog will also need their teeth cleaned professionally more regularly if you do not brush their teeth. This will cost more money in the long run and can lead to complications. Your best bet is to brush your dog’s teeth regularly at home or use a no-brush toothpaste. How many times a week should you brush your dog’s teeth? Generally, a dog should have their teeth brushed at least 2-3 times a week. However, brushing their teeth more often than that is hardly ever a bad thing. Of course, your particular dog might have other brushing requirements, so we recommend speaking to your vet for a suitable brushing schedule. How can I get plaque off my dog’s teeth? Removing plaque off your dog’s teeth is as easy as brushing them. Plaque begins for form shortly after your dog eats. Brushing your dog’s teeth should remove the majority of this plaque, however. Real, raw bones, as well as dental toys and treats, can also remove this plaque. If the plaque is not removed within a reasonable time period, it can harden into tartar, which is much harder to get rid of. Brushing your dog’s teeth is just important as giving them probiotics. The only fool-proof, safe way to remove tartar from your dog’s teeth is to take them to the vet. Your vet is experienced in canine oral care and can safely clean their teeth for you. If you think your dog might need their teeth cleaned, we recommend speaking to your vet. In the long run, it is always better to brush your dog’s teeth and prevent tartar from forming in the first place than trying to remove it after it has already developed. We also reviewed 20 other toothpaste for dogs. Even though these didn’t make out 5 best dog toothpaste list, they’re the best of the rest, and each is still a great option for your dog. The information you’ll need to compare each one is included with each listing. Suitable for both puppies and kittens, this dental kit comes with a finger brush and meat flavored toothpaste. While not currently reviewed on Amazon USA, this product is quite popular within the UK pet market. 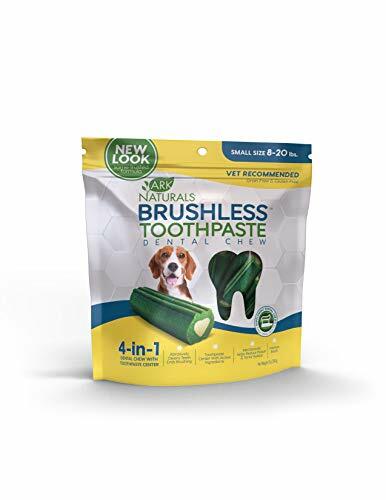 Suitable for puppies, as well as mature dogs, this toothpaste is infused with tea tree leaf and rosemary leaf and is veterinarian grade quality. This product currently has no reviews on Amazon but has proved popular on other websites, so it is ideal for customers looking to try something new. Suitable for puppies, toy breeds, and even kittens, this all-natural product has a vanilla taste, which is more uncommon for pet toothpaste. It also comes with a correctly sized brush for small pets. Customers were amazed at how much their puppies loved the flavor of the toothpaste, and many found that teeth cleaning suddenly became a treat for their dog. This product is highly affordable and is available in two sizes. It is also all natural, meaning it doesn’t have any harsh chemicals which could unsettle a puppies sensitive tummy. Customers found this toothpaste certainly had their dogs seal of approval when it came to taste! This toothpaste comes with a brush designed for puppies, featuring softer bristles. The toothpaste itself is completely organic. Customers noted their puppies really enjoyed the taste of the product and found it was the perfect introduction to teeth brushing for their pet. 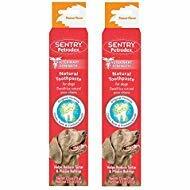 Bought as a two-pack making it ideal for owners with multiple dogs, this enzymatic toothpaste also comes with brushes and is flavored like beef. Customers loved how easy the toothbrushes were to use. This product comes with toothpaste, as well as a standard toothbrush and finger brush, and is mint flavored. People loved the cleaning performance of the product, as well as the affordable price tag. Developed by veterinarians, this toothpaste is peanut butter flavored, and though reviews are limited, so far this product has achieved 5-star reviews. This product would be ideal for customers who have previously been dissatisfied by other enzymatic toothpaste on the market. This enzymatic toothpaste is poultry flavored, making it suitable for both dogs and cats, so it is ideal for use in multi-pet homes. Customers found that dogs enjoyed the taste of the product so much that brushing became easy, even with dogs who had been resistant previously. This toothpaste is flavored with vanilla and mint but is also available in four other flavors, including poultry, malt, beef, and seafood. It is suitable for both dogs and cats. Customers have noted the effective results across a variety of breeds. Available in smaller quantities and in bulk, this dental chew is an ideal option for pets who refuse to brush, as these chews help to clean and strengthen teeth. Customers were highly impressed at the results achieved by these chews when compared to standard brushing. This dental chew is available in a variety of sizes to best suit your dog’s mouth when chewed. This product creates a protective seal around the mouth to help prevent damage or decay. Customers found this product immediately freshened their pet’s breath, as well as provided superior cleaning to hard to reach molars over time. These brushing chews are available in a range of sizes and flavors to suit all breeds and gently clean teeth as the dog chews them. Customers have trust in this product as it is made in the USA and found it combined treat time with dental hygiene. This product offers a cleaning alternative to toothpaste and treats and is ideal for dogs who love to chew. It offers effective cleaning as is, or with the addition of toothpaste. Customers found this particularly effective for smaller breeds whose mouths are more difficult to reach with a conventional brush. Available in a range of sizes to suit most breeds, these dental chews come in a pack of 30 and are free of protein and gluten. They are also suitable for dogs with a rawhide intolerance. While some dogs can take or leave these chews, owners of those who enjoy them have noticed a marked improvement in their pets dental health. This set comes with chicken flavored toothpaste that is safe for dogs and cats, as well as a double-headed brush which can clean the inside and outside of a dog’s tooth at the same time. Purchasers loved how easy the toothbrush made cleaning, as well as how much their dogs enjoyed the toothpaste’s flavor. This dental care set comes with a standard toothbrush, a finger brush, and toothpaste that can be either vanilla or cucumber mint flavored. The toothpaste is designed for breath and tartar control, and customers found this highly effective for both big and small dogs. This dental hygiene set is designed for dogs aged 1.5 years and up. 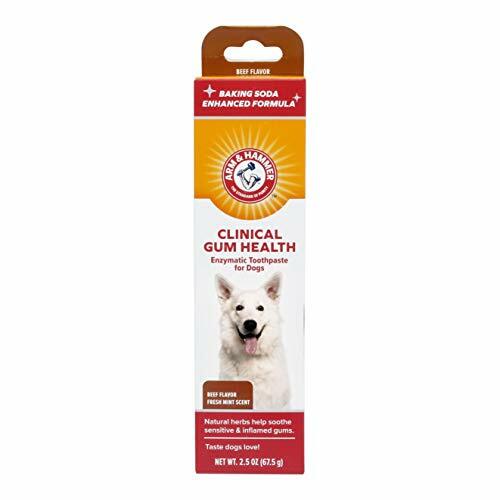 It has a completely organic toothpaste formula and a brush with a wide handle, allowing owners to provide their dog’s teeth with a thorough clean. Customers who purchased the product absolutely loved it, and all reviews on Amazon have given this set a five-star rating. This set is suitable for puppies and toy dogs come in an adorable carry case for easy travel. It includes a double-headed toothbrush, toothpaste, and a finger brush. Customers found this product gentle and ideal for older dogs as well as puppies. This oral care kit comes in two sizes for large and small dogs and comes with a TripleFlex™ toothbrush, finger brush, and mint flavored brushing Gel. While customers did question the durability of the brushes, the brushing gel was a big hit. Kristin Hitchcock is a frequent contributor at Pup Life Today. She was born and raised in Tennessee and currently lives there with her husband and toddler. Kristin is passionate about helping pet parents weave a fulfilling and enriching life for their pets by educating them about lesser-known topics and helping them make the best decisions possible for their pets. She owns three dogs, three cats, two fish, and a lizard.